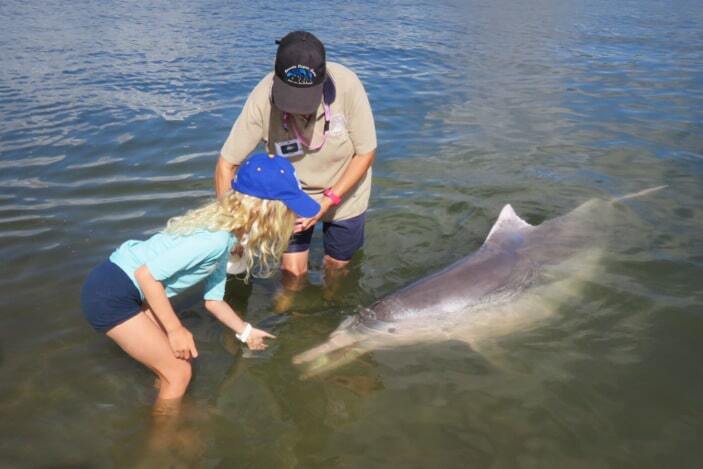 Did you know that in just over two and a half hours’ drive from Brisbane, you can hand-feed wild dolphins? 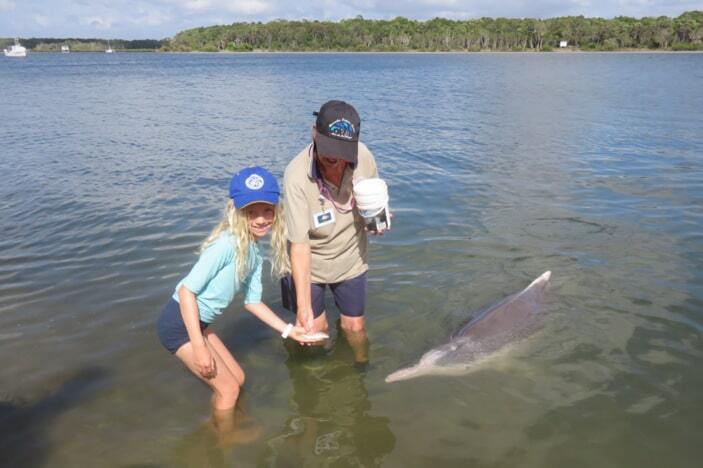 Wild Dolphin feeding at Tin Can Bay is an incredible life experience that we highly recommend! 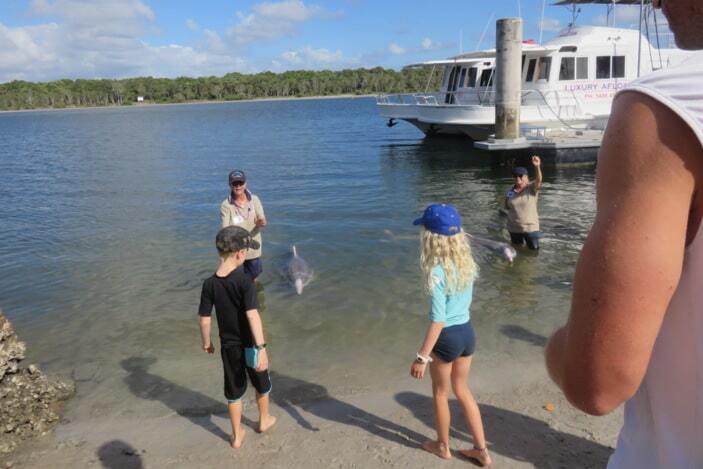 The dolphin feeding takes place at Barnacles Dolphin Centre and Cafe, and this activity brings thousands of visitors every year to the quiet, picturesque fishing village of Tin Can Bay. 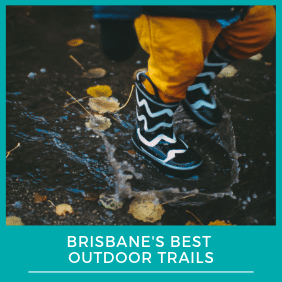 It gives Brisbane Kids the opportunity to have a magical encounter with a spectacular marine animal in its natural habitat. It is also an educational experience where kids can learn all about dolphins, their habitat and how to protect them. Where is Tin Can Bay? 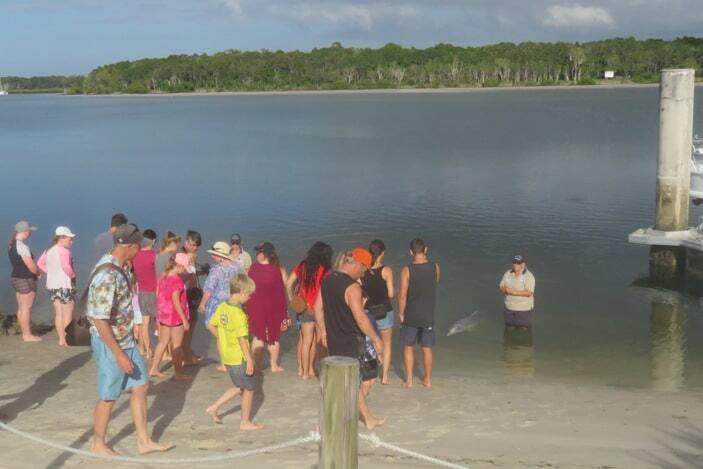 The dolphin feeding is run every day of the year by a dedicated group of local volunteers. Make sure you arrive by 7 am for the best chance to take part in the feeding and to make the most of this memorable experience. After purchasing your tickets, the volunteer group make special presentations on the dolphins and answer questions from visitors. 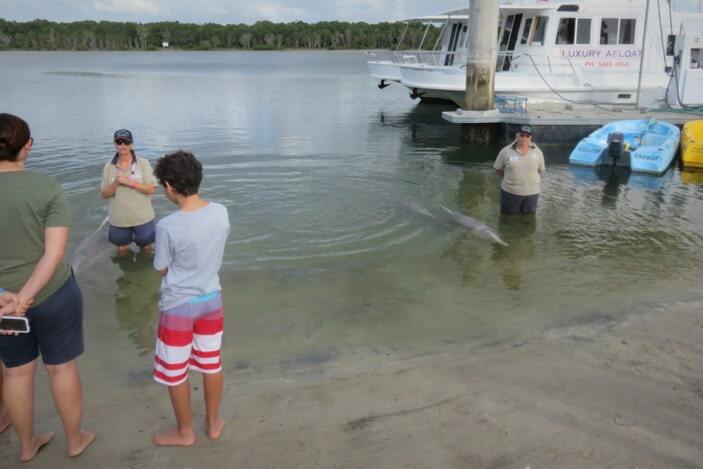 The knowledgeable volunteers tell a story of how the dolphins first came to interact with the locals of Tin Can Bay. They also give an informative talk about the nature, behaviour and diet of these (now rare), Australian humpback dolphins. You will be introduced to the main dolphins in the pod and get to know more about the ones who are visiting that day. On the day we were there, we were introduced to the leader, Mystique, a dolphin named Patch, and Ella with her gorgeous calf Joe. 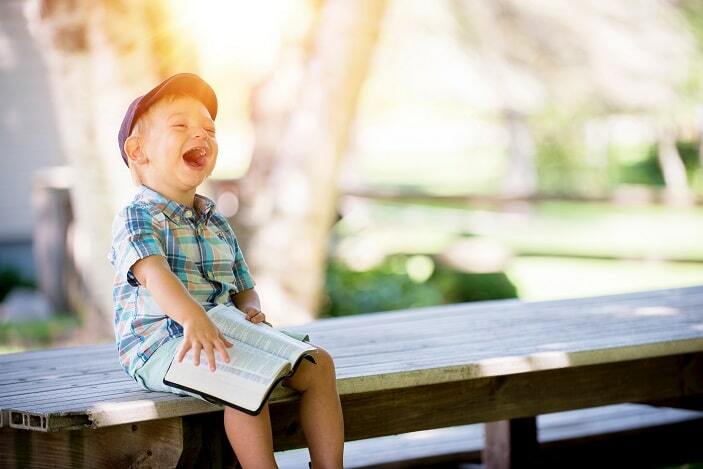 Your kids will learn all about the threats to the dolphin and its environment, and how to take part in the feeding in order to protect these precious animals. For the feeding, each person is given a bucket with a fish in. Hands are washed in an anti-bacterial solution in order to ensure nothing dangerous is passed onto the dolphins through contact with the fish. The feeding obviously takes place in the water, close to the beach. The volunteers will guide you on how to enter the water and feed the dolphins. You will wade out to about knee deep in the water so that the Dolphins are able to swim up to receive their fish. You can see the dolphins beautiful pink and grey markings, and they will turn to the side to make eye contact with you! You are unlikely to have a similar experience you can compare to a wild dolphin interaction. They are such a friendly and inquisitive creature and incredibly graceful in the water. Taking turns each person will hold out their fish as the dolphins take them ever so gently. It is an unexplainable feeling to be in the water right next to these remarkable animals! The dolphin feeding at the Barnacles Dolphin Centre is environmentally governed to ensure that the dolphins stay healthy and remain wild. 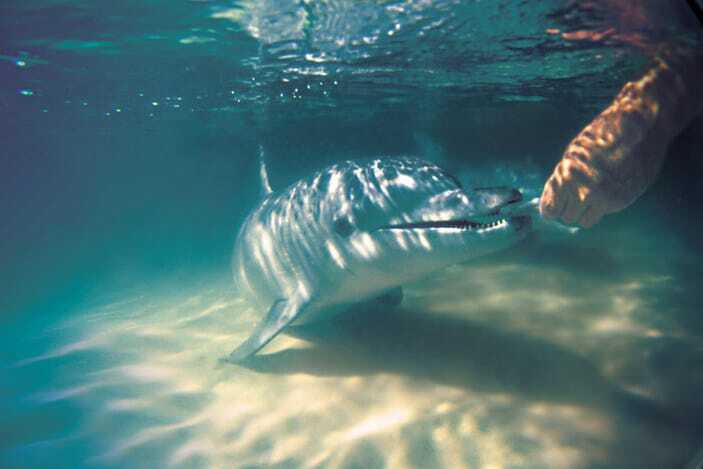 For example, a maximum quota of fish is allowed per animal, so the dolphins cannot become reliant on people for food. 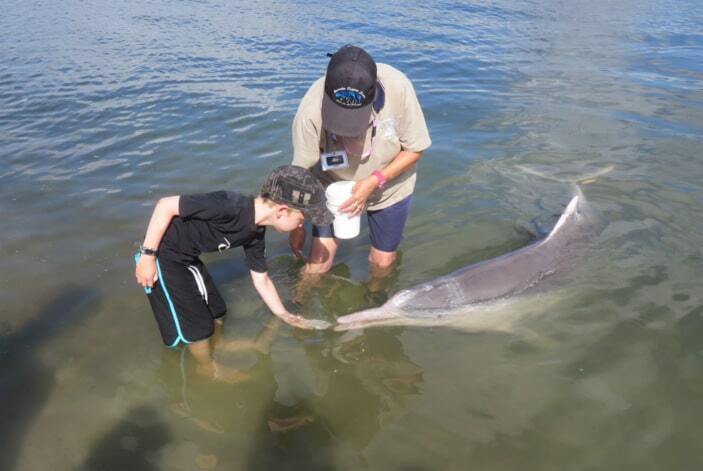 Monitored by the Queensland Government, there are tight regulations and procedures in place to protect the dolphins and ensure the experience is enjoyable for both animals and people. The on-site volunteers make sure that everyone knows where to go and what to do. The volunteer group also works with the Environmental Protection Agency (EPA) by supplying information on the dolphins who have visited and how much they have been fed. 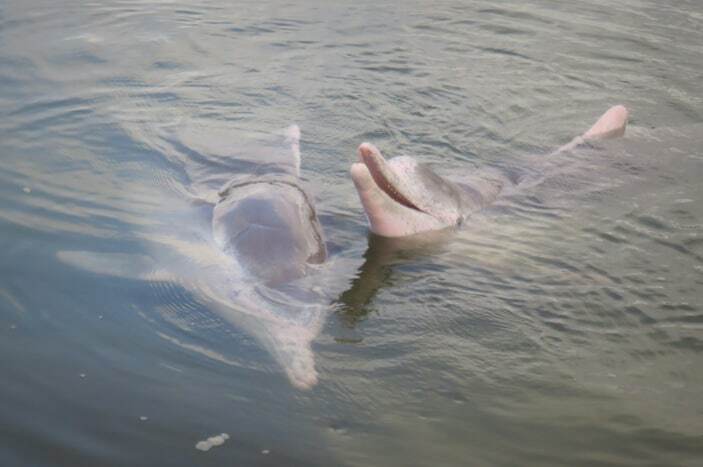 The dolphins that visit Barnacles Dolphin Centre are Australian humpback dolphins. 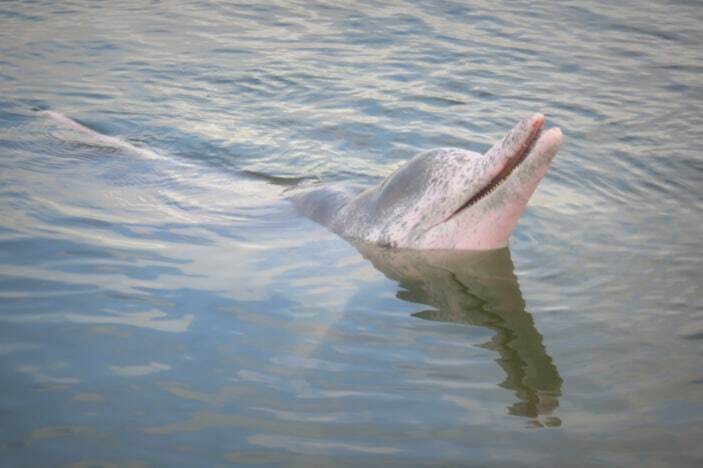 This is a type of river and estuarine dolphin. This particular dolphin lives in the waters reaching from the Great Sandy Strait to the Tin Can Inlet. The Australian humpback dolphin is classified as vulnerable by the IUCN Red List of Threatened Species, with numbers in the low hundreds left in this area. Threats include pollution, sharks, fishing nets, overfishing and boats. The dolphins live in pods of around five, led by an alpha male or alpha female. They are shy creatures that live on a diet of fish, prawns, molluscs, crabs, squid and octopus. There is a resident pod of about a dozen humpbacks that visit Barnacles at Tin Can Bay. The pod is led by the alpha male, Mystique. It also includes a mature female, Patch, a juvenile male called Harmony, Ella and her calf Joe, Aussie and her calf Luna, plus Squirt, Valentine, Chompy and White Fin. Each of the dolphins has unique markings and a distinct personality. Not all of them visit the centre every morning. In fact, Mystique decides each day who gets to come and who doesn’t! In the early 1950s, a dolphin was injured very badly by a boat and beached itself on the sand next to the Norman Point boat ramp. Locals noticed the animal in need and began feeding him. He was so scarred along his back from various past injuries that they named him ‘Old Scarry’. When Old Scarry was well enough to fish for himself, he returned to the bay. The locals thought that was the last they would see of him, but from then on, he regularly returned to visit and have a bit to eat, bringing other dolphins with him, until he finally disappeared in the 1980s. A female thought to be Old Scarry’s daughter, also called Scarry, continued to visit the bay, and in 1991 she arrived with a new calf, who the local school children named Mystique. Mystique continues to come for a feed every day, and now brings members of his own pod with him, just as his grandfather did. Dolphin feeding is available every day throughout the year. Of course, being wild animals, there is no guarantee which or if any dolphins will show up, but it is rare for none to come. The Dolphin Centre opens at 7 am. We strongly recommend getting here then, as there is a maximum quota of fish available for each dolphin. This means that if only a couple of dolphins show up, fewer people can do the feeding, so it’s best to be among the first there. The cost is $5 entry fee per person, plus $5 for the feeding. The fish are provided, and feeding takes place at 8am. 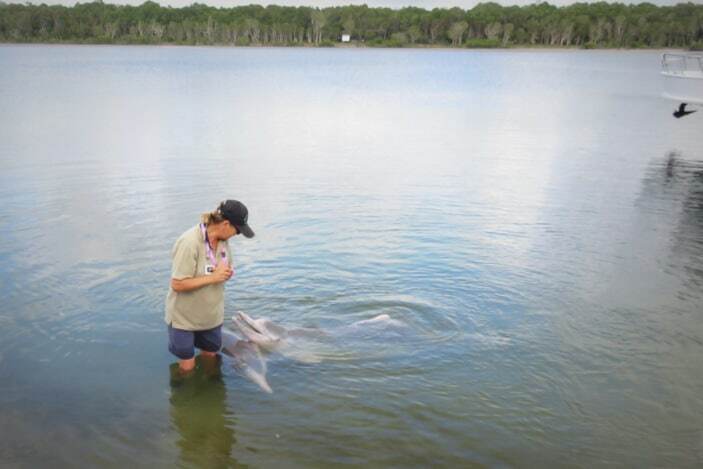 The wild dolphin feeding can only be done at Barnacles Dolphin Centre and Cafe, which is located at the Norman Point boat ramp, Tin Can Bay, Queensland 4580. You can find out more at barnaclesdolphins.com.au or call them on 07 5486 4899. Please note that this experience is only available through Barnacles Dolphin Centre. Feeding these dolphins from a boat is not only illegal but also dangerous to the dolphins as it encourages them to get too close to boats which can injure and kill them. Touching or approaching wild dolphins also carries very large fines. Tin Can Bay is in the Wide Bay–Burnett region in Queensland, Australia. From Brisbane, you take the M1 towards Gympie as if you were headed to Rainbow Beach or Fraser Island. From there use the map below to direct yourself along the Tin Can Bay road and towards Norman Point, Tin Can Bay. We hope you enjoy this amazing wildlife experience! 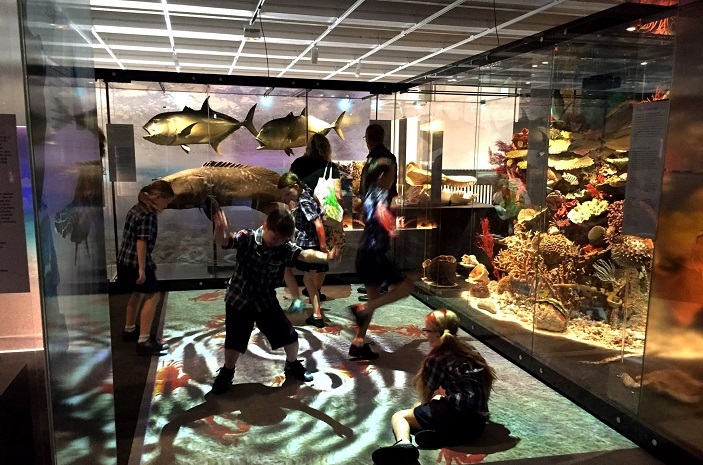 For other amazing animal encounters, check out Animal Encounters Near Brisbane.